Hockey Plumber: The +/- of the NHL's off-season. With only a handful of potentially impactful free agents remaining, it seems safe to analyze the franchises that have helped or hurt themselves this off-season. Most teams fall into an incomplete category due to many unknown variables involved. Therefore, we will grade each team by whether they have left us with reason to be enthusiastic about (+) or to question (-) their moves. We will begin with the Atlantic Division. (+) New Jersey re-signed their best young centerman, Travis Zajac, and best over-all defenseman, Johnny Oduya, and also kept strong, veteran leader Shanahan. They have maintained plenty of available cap space to add at the trade deadline and in the years to come. (-) The Devils lost mainstay winger Brian Gionta, and it remains to be seen if Nicklas Bergfors is up to the task of replacing his production. The team also waived goodbye to backup goaltenders Kevin Weekes and Scott Clemmensen, who carried the team last year in Brodeur’s absence. Should Brodeur fall victim to injury again, will Jeff Frazee be ready? 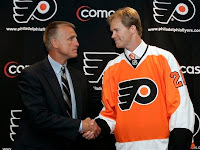 (+) Philadelphia traded for the much hyped blueliner, Chris Pronger. Pronger does improve their defensive core, but at what cost? Philly was unhappy with their goalie performance last season and replaced them with the enigmatic Ray Emery and Brian Boucher. (-) The cost for Pronger was trading winger Joffrey Lupul and top defensive prospect Luca Sbisa. Pronger is still a good defenseman, but is not the player he was just a few years ago. The Flyers also parted ways with consistent winger Mike Knuble. Adding an aging, declining, suspension magnet in Pronger to a team with a penchant for the untimely penalty may not prove to be wise. To make matters worse, Philly signed Pronger to a long term extension that goes in effect after he turns 35, which means they will be responsible for the full term of the contract when he will be 42 years old. The team will also miss the 50+ goals of Lupul and Knuble, and could suffer a major headache with the explosive Emery should things no go well for him. Although there has been much ado over the addition of Pronger, the Flyers have hurt themselves more than any other team in the Atlantic. (+) The Isles used the number one overall draft choice to stir excitement in their fan base and reel in ultra-talented center John Tavares. 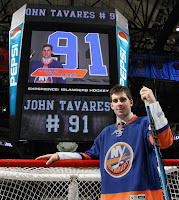 Tavares will be given a shot to play right away with their other young guns Kyle Okposo and Josh Bailey. Since their star goalie Rick DiPietro’s health is still in question, the Isles secured the position by adding two potential starters in net with Dwayne Roloson and Marty Biron. Should DiPietro return to form, the team has excellent trade value on their hands come deadline time. Off the ice, the Isles have made positive strides securing a new arena which would stabilize the franchise and provide much needed new revenue streams. (-) The team has lots of young talent, but the Isles would have benefited by adding a few more veterans to show the young guys how to get it done. With three of their best skaters all under the age of 21, it may take longer than Islander fans would like for this team to make progress in the standings. (+) The reigning Stanley Cup Champions re-signed the popular, gritty, leader it needed in Bill Guerin and also brought back playoff performer, Ruslan Fedotenko at reduced costs. The team has few holes and has already shifted its off-season focus to re-signing next year’s potential free agents Sergei Gonchar and Kris Letang. (-) Pittsburgh lost defensemen Rob Scuderi and Hal Gill. Scuderi made the hockey world take notice with his spectacular play in last years playoffs. Scuderi and Gill were paired together as the Pens shutdown tandem. It will vital for newcomer Jay McKee to pick up the slack defensively. (+) New York made a big splash trading away cap albatross Scott Gomez and prospects for Chris Higgins and prospects. Not only did the Rangers clear cap space, but also received a consistently productive forward in Higgins at a fraction of the cost. In addition they signed uber UFA Marian Gaborik and picked up the versatile Vinny Prospal who can fill a number of roles. (-) In losing Gomez, Nikolai Zherdev, Nik Antropov and Colton Orr the Rangers begin the new season without their top three scorers and an enforcer skilled enough to play all 82 games. Gaborik is a deadly sniper when healthy, but has been extremely fragile. If he cannot stay in the lineup, the Blueshirts have another bad contract to add to the pile. New York signed Donald Brashear to fill the void left by Orr’s departure, but paid too much for a guy who just won’t be up to the job. The team also has to decide what to do with talented forward Brandon Dubinsky. He has shown flashes of talent, but is looking to get paid as if he has arrived. Higgins, Prospal and Gaborik are a boom or bust trio. Gaborik is the lynchpin. If he cannot get it done, it will be a major setback to the organization.